Fully Licensed and Insured - Vet and Environmental Health Dept Approved. 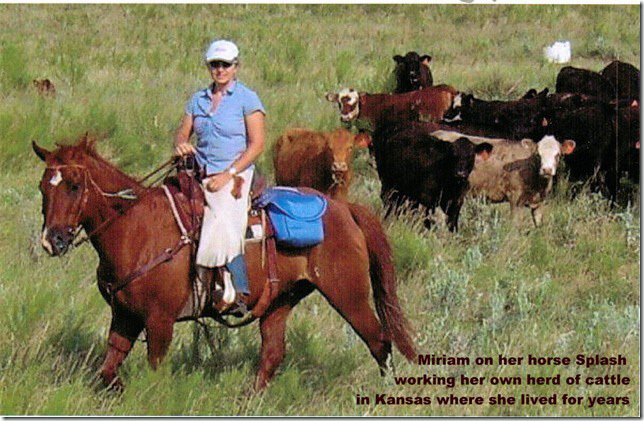 Miriam has lived for years on a working cattle ranch in Kansas USA where daily, she helped care for, doctor and work 600 head of Angus cattle, including 50 of her own steers and heifers. She was a volunteer of the Kansas Humane Society for Dogs where she often rescued stray and abandoned dogs who were victims of tornados. She would then rehabilitate them by teaching the dogs new skills such as working with cattle and horses. Miriam is also an expert in Equissage Massage for horses, mostly high performance horses. She performed these skills in USA on Stallions at stud in Louisiana, also at rodeos on cowboys competition horses and has worked with most of the Scottish Racehorse Trainers and Scotland's leading Show jumpers, Dressage and Event riders. This service is available upon request for any horse owners. As well as being an animal lover Miriam is also an accomplished artist to trade and can often be found in her studio working on another commissioned oil on canvas. Please feel free to ask for more info on Equissage or Art. Miriam's love of dogs is the result of the creation of Scotland's Premier Dog Holiday Service known as Bespoke Home from Home Dog Boarding. She developed the Home Boarding business in 2001 after having spent many years travelling abroad on business trips and often struggling to find a suitable boarding solution for her own dog. 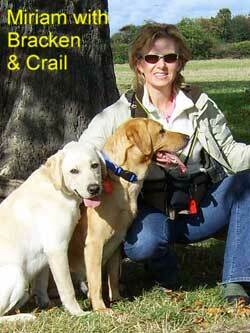 She and her family owned Golden Retrievers, a Great Dane and a Flatcoat Retriever. Kennels were never going to be an option for those pampered pooches. Fortunately Miriam and her family were able to home board the dogs with a friend in a home environment, tailor made to their specific needs. Miriam soon realized that there is a huge demand for such a bespoke service and decided to recruit a team of suitable dog loving Carers who thoroughly enjoy caring for all 400 + pampered pooches who each use this tailor made service often several times per year. The dogs enjoy a proper dog holiday and often bond with other dogs in boarding allowing them to have lots of supervized fun and games as well as daily walks in the country or at the beach with their allocated Carer who owners meet at a dog interview in advance of boarding. Dog owners can discuss their dogs specific needs with the Carer whether it be medication, specialized diets, ongoing puppy training or special care for elderly dogs. We are also flexible with our times of opening to suit our clients busy schedules. We look forward to meeting with you and your dog! All photographs and artwork © of Miriam Fraser.